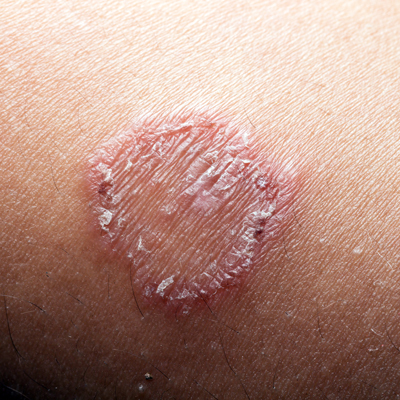 Ringworm is not a worm — it is a fungus of the skin. There are a number of different fungi that infect the skin and can cause different kinds of rashes and issues. Most common fungi respond well to traditional antifungal medications. Ringworm of the scalp is known by the medical term, Tinea capitis. It often occurs in young children and can appear as a scaly plaque on the scalp. Often there is broken hair or loss of hair in the area. With time, there will be swelling of the involved skin as well as swollen glands in the neck and behind the ears. It is contagious until it is treated. It is rare for adults to have ringworm of the scalp, although it occurs a little more commonly in African-American women. It is usually treated with oral antifungal medication with or without the addition of a medicated shampoo. Ringworm of the body is known by the medical term, Tinea corporis. It can occur in children or adults and often appears as a red scaly rash in the shape of a ring. Over time, multiple infected areas can develop. It is contagious (transmitted usually by direct contact) until it is treated. Diagnosis is made by the dermatologist by taking a scraping and examining the scraping under the microscope to identify fungal organisms. It is often treated with antifungal creams although in severe cases, oral antifungal medicine may be needed. Other areas of the body may be infected with fungus. The face is a common area. This is known as Tinea faceii, or in the case where the beard region is involved, Tinea barbae. When the feet are involved, it’s known by the common term “athlete’s foot.” The medical term is Tinea pedis. When the nails are involved, this is known as Tinea Unguium or Onychomycosis. When the hand is involved this is called Tinea manuum. Often, a fungal infection on the feet leads to the infection on the hand. If you notice scaling on the scalp in a child, or a red rash in the shape of a ring, on a child or adult, please call Brinton Lake Dermatology for an evaluation by one of our physicians or physician assistants. Other signs of fungus infection are scale between the toes, thickened nails or a rash on the palm. The practitioner in our office may do a fungal scraping, and check it under the microscope in our office for signs of fungus. Other times, we simply send off some skin scrapings to the laboratory for diagnosis. It is important to treat ringworm since it is contagious and will spread to others. In most cases a topical antibacterial solution is used. Once evaluated your dermatologist will make the best recommendation.